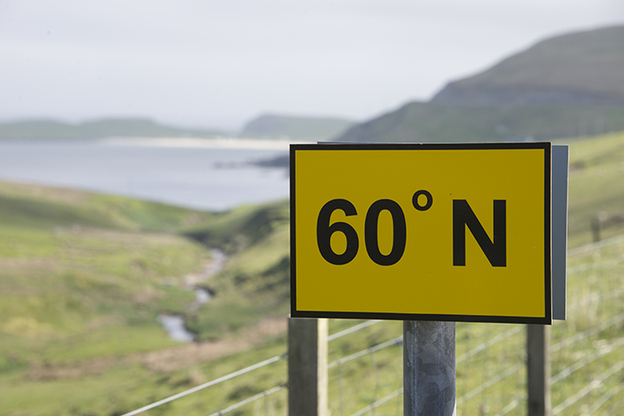 In 1999, when I first visited Shetland, I was presented with a certificate confirming that I had been farther north than 60°; it was a marketing ploy, but I was pleased to receive it – and still have it. Latitude, clearly, was anything but a geographical platitude to these people of the far north of Britain, closer, as they are, to the Arctic Circle than they are to London, and on a level with Hudson Bay in Canada, St Petersburg in Russia, Stockholm in Sweden and Helsinki in Finland. 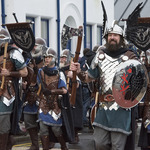 There is about Shetland an other-worldliness that is difficult to pin down; it’s certainly not ‘Highland’ Scotland, nor is it unswervingly Scandinavian, although they do like their Viking heritage, especially the annual fire festival, ‘Up Helly Aa’, held in the middle of winter to mark the end of the yule season. But it’s more fundamental than that; there is a prevailing synergy of harmonious inter-relationships founded on self-sufficiency and communality; Shetland is remote, and when you are this far from outside help, you don’t fall out with your neighbours – tomorrow you might need them to save your life. So the upshot is a relaxed pleasantness with everyone, including touring strangers. And you get a taste of it the moment the Aberdeen ferry arrives in Lerwick; it’s 7.30 in the morning, but take your car ashore, park up, and then come back aboard and have a relaxing breakfast…there’s no hurry. 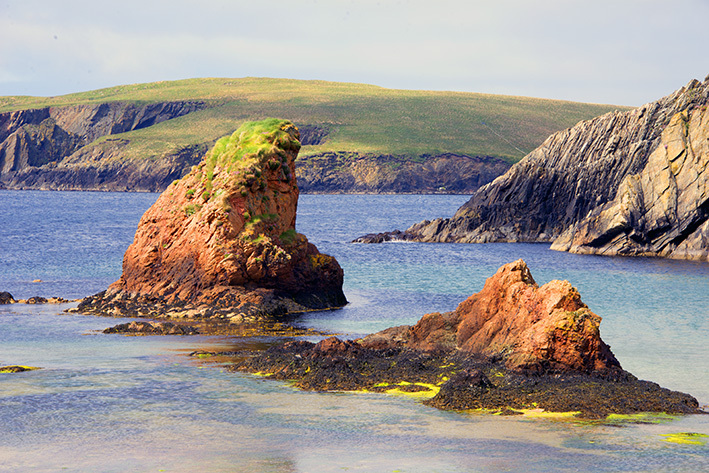 Shetlanders know their islands as ‘The Old Rock’; and a magnificent rocky landscape it is, too, one that, like many of the Scottish islands, either enthrals, or sends you back none the wiser. Geologists will love it. 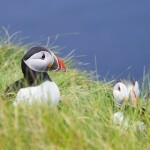 Bolstered by about 100 smaller islands, the bulk of Shetland comprises the mainland and three northerly islands, Yell, Unst and smaller Fetlar, the latter home to a large population of red-necked phalarope, one of Britain’s rarest birds. 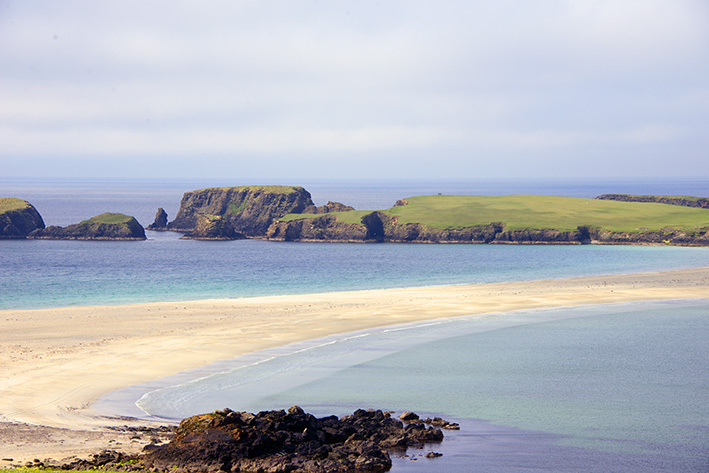 Shetland – just that, not ‘Shetland Islands’ – lies 100 miles north of the Scottish mainland, and are 70 miles from north to south, a fascinating, sprawling, convoluted archipelago, where land and water intermingle. This is the land of light nights, of the ‘Simmer Dim’, as they call it, where anyone intent on seeing both a sunset and sunrise will get only a few hours’ sleep in between. I last visited at the end of May; sunset was 10.13 pm; sunrise 3.52am, and it never really became dark in between. It’s an odd but rather pleasing sensation, as close as you can get in Britain to 24 hours of sunshine. Not surprisingly, in a place where the Atlantic and the North Sea confluence, a coastline that is dramatic and stunning is the norm. A mish-mash of gloups, sounds, wicks, steep-sided geos and deeper, wider voes, penetrate the land, and make for a vexed and bewildering geography. You struggle here to get as much as three miles from the sea. Yet in sight of so much water, Shetland is shy of rivers. Here only modest burns fashion a gentle course through a landscape that is even less tolerant of trees. The north-west mainland is known as Northmavine, and possesses around Eshaness a spectacular Atlantic coastline with no comparison. All but a handful of lochans are requisitioned by red-throated divers that hunker down against the wind. Chambered cairns litter the landscape, black-backed gulls line Loch of Houlland like spectators at a football match, opportunistic gulls eye the salmon cages out in Yell Sound, waiting – which, in Shetland, is a great way to pass the time. 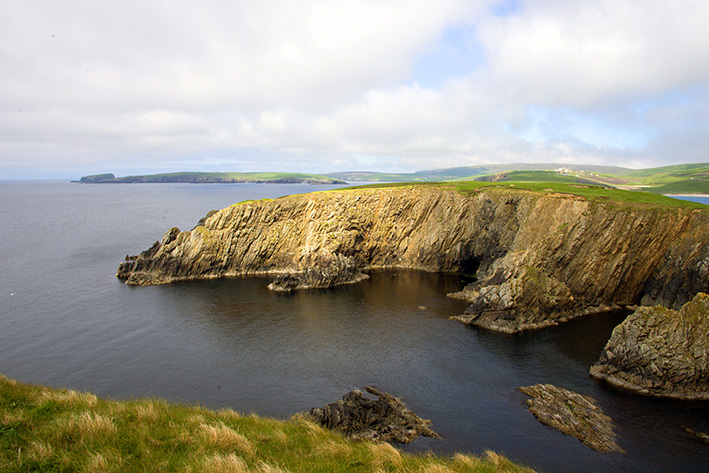 But for many visitors, their first sight of Shetland is Sumburgh Head, at the southernmost tip, standing proud above the sea swell; almost part of it. A lighthouse marks the spot, erected, like its sibling on Muckle Flugga at the far northern end of Shetland, by the monopolistic lighthouse-building Stevenson family. Today, Sumburgh is famed neither for sea-defying Fitful Head nor its bleakly located but otherwise pleasant and efficient airport, by-product of World War II. 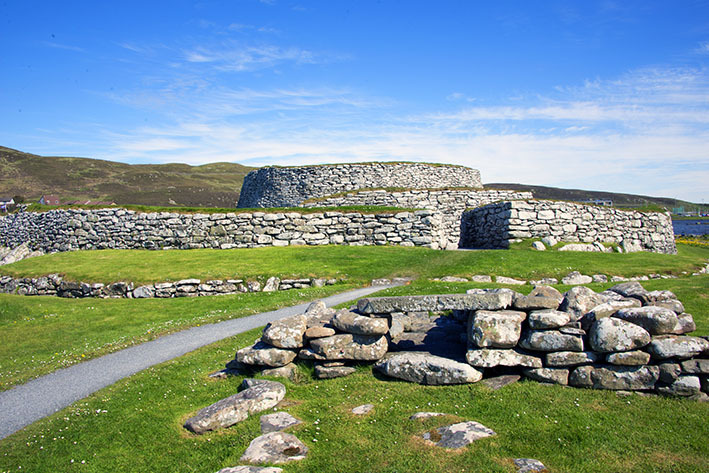 Here it’s all about Jarlshof, one of the most remarkable archaeological sites ever excavated in Britain, a place that re-entered the world when violent storms exposed its stonework, rather in the manner of Skara Brae on Orkney. 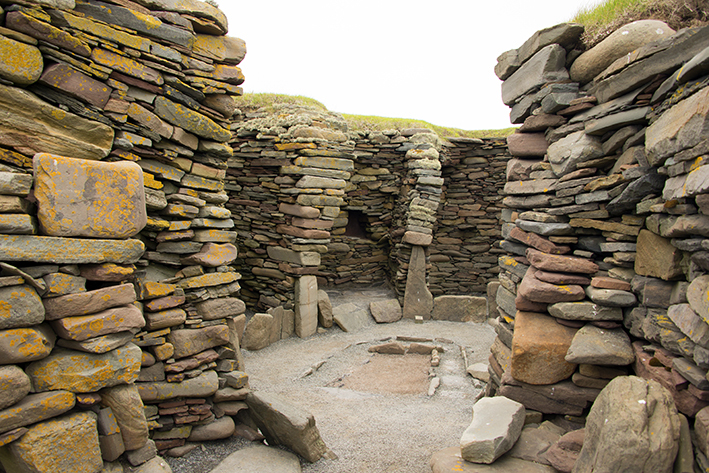 Prehistoric man, Vikings, medieval and modern man clamour for attention here; the dwellings of each virtually superimposed on each other. And it is this timeline of humanity that hallmarks Shetland, that and the outstanding legacy of wildlife, notably birdlife. Layer upon layer of Man’s history vie for your attention against its natural history: often they go hand-in-hand. 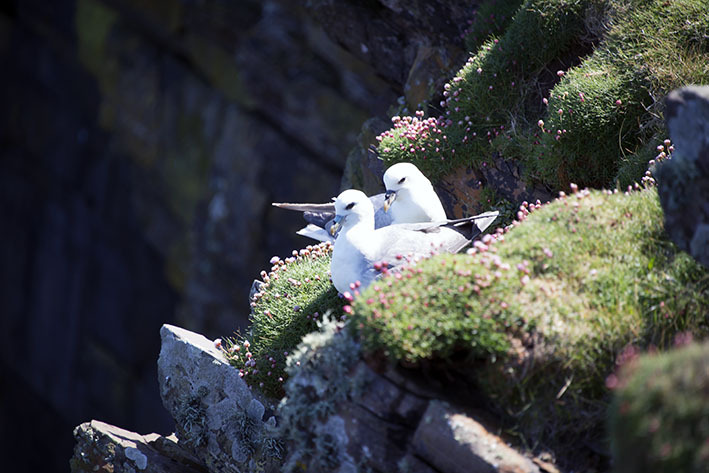 A trip to the nearby island of Mousa features not only the finest broch in Britain, but a sky filled with fulmar, great and Arctic skua, Arctic and Little tern, common gull, raven and, if you can stay awake long enough the night-time return of the diminutive storm petrel that come ashore to roost only when they feel safe from the attentions of marauding birds. Then there are the idiosyncrasies: every bus stop at a rural road junction has a car park so that locals living off-route don’t have to use fuel to drive to Lerwick when a bus ride or car share does just as well; every bus stop has seating from a conventional bench to plush armchairs, and one, at Baltasound on Unst, is equipped with reading material, curtains, carpets, flowers and, for a time, served as a two-person cinema showing brief films made by the island’s school children. 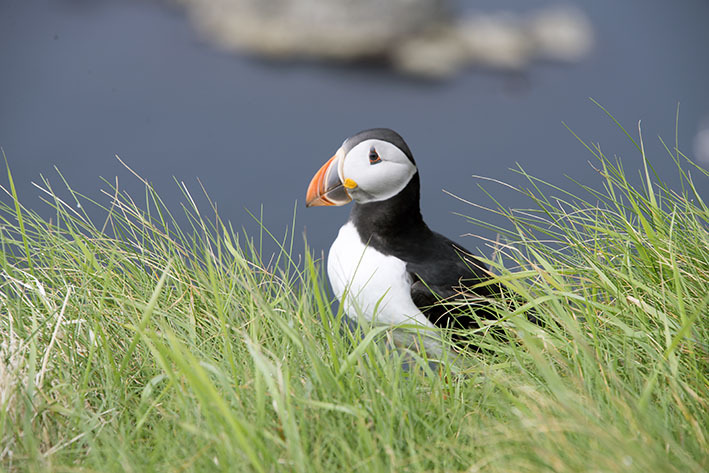 But that’s what makes Shetland such a breath of fresh air – often literally – the ability to deal with problems in an unconventional way, and that in turn makes a visit to the far north of Britain such an unending joy. It can be windy here: after all, Shetland lies in the track of the Atlantic depressions but is bathed by the relatively warm waters of the Slope Current, flowing north along the edge of the Continental Shelf, so the climate is classed as temperate maritime. Come prepared for cold, wet and windy, but with a smile on your face, and glorious days of sunshine, balmy sea breezes and, if you’re lucky, the aurora borealis, will keep it there. The tourist information centre is in Market Cross, Lerwick, Shetland ZE1 0LU. By ferry: Shetland is well served by ferries, with departures seven nights a week in both directions on the Aberdeen-Lerwick route, all year round. Inverness (1 hour 40 minutes) via Orkney (35 minutes). 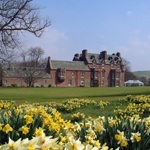 You can easily reach Aberdeen, Edinburgh, Glasgow and Inverness from London and other parts of the UK. Aberdeen has the additional advantage that, should there be any disruption to flights, and it is often possible to transfer to the overnight ferry. If you are travelling from outside the UK and would prefer to by-pass London’s ‘bottleneck’ airports, Edinburgh and Glasgow have flights from many European cities, some North American airports and the Middle Eastern hubs of Dubai, Doha and Abu Dhabi. Shetland Islands Council operates an inter-island ferry service that connects the larger islands with Mainland. The services are fast and frequent, and passenger fares are very reasonable. Bolts Car Hire. Tel: 01595 693636; . Only Star Rent-a-Car is based at the airport, both the other operators will meet you there with your hire car.